This was because he believed that humans and beans were spawned from the same source, and he conducted a scientific experiment to prove it. He buried a quantity of beans in mud, let them remain there for a few weeks, and then retrieved them. He noted their resemblance to human foetuses, thus convincing himself of the intimate relationship between beans and humans. To eat a bean would therefore be akin to eating your granny. Equally, to crush, smash, or dirty a bean would be to harm a human. Therefore the rule they all agreed to abstain from beans. 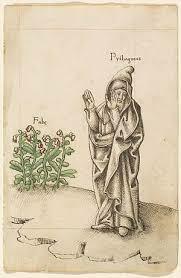 Pythagoras also cherished silence because it involved deep reflection and meditation. All well and good I hear you say but what about this ban on eating beans?.